©2001 Majestic Percussion. Reprinted with permission. Both diversity and virtuosity are rarely achieved at the level that David Steinquest has attained. As a mallet percussionist with the ability to amaze and dazzle an audience, he performs the most challenging solo and ensemble literature with apparent ease. A noted composer, arranger, clinician, guest lecturer, and educator, he holds a Bachelor of Music Education from Northeast Louisiana University and a Master of Music in Percussion Performance from the University of Michigan. David’s outstanding talents have afforded him countless performance opportunities in the Nashville area including numerous studio sessions, CD recordings, and live symphony orchestra, musical theater, and jazz concerts. He has extensive orchestral experience, having performed with the Monroe Symphony, Greenville Symphony, Arkansas Symphony, Ann Arbor Symphony, Jackson Symphony, and presently with the Nashville Symphony Orchestra, including the group’s Carnegie Hall debut on September 25, 2000. In addition to performing, David is an accomplished and prolific composer and arranger with many works published by Studio 4 Music, Pioneer Percussion, and Row-Loff Productions. His works have been performed by the Nashville Symphony percussion section, and have been heard on the PBS children’s series “Mr. Rogers’ Neighborhood”. A strong commitment to music education has produced masterclasses, articles, and methods including Life’s Little Rudiment Book and All-Star Warm-Ups. Steinquest is currently Director of Percussion and Jazz Studies at Austin Peay State University and coordinator of the Mid-South Jazz Festival. He has previously served as a faculty member at Albion College, the University of Arkansas at Fayetteville, the National Music Camp at Interlochen, and was a member of the United States Military Academy Band at West Point. This guide is intended to provide the middle and high school instrumental music director with a purchasing plan for mallet percussion. Instruments which are the most durable, and therefore have the longest life in the school situation, have been recommended. Height adjustability offers the greatest value to band directors and percussionists by allowing each student to play at the ideal height, thereby promoting proper technique. Every instrument should have a cover to protect it when not in use. 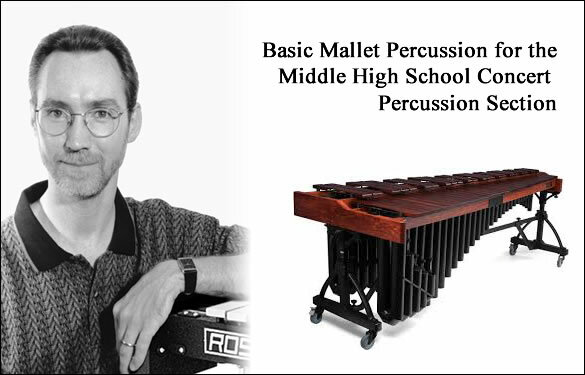 A room dedicated to mallet percussion is good for long-term storage and practice. Instruments are listed in a recommended purchasing order starting from “ground zero” (e.g. bells first, xylophone second, chimes third, etc.). In addition to information explaining why each instrument is the ideal option, “helpful hints” are included which provide extra suggestions or solutions for educators. The advanced middle school can draw from the list for the high school percussion section and the advanced high school is limited only by its equipment budget. Let the level and type of literature and its requirements be the guide for further purchases. Aluminum bars provide good sound projection, are lightweight, and more economical than steel bars, making them ideal for the middle school. Helpful Hint: Bells played with softer mallets can substitute for chimes, vibraphone or celeste. Concert bells can also substitute for crotales. A synthetic bar instrument with adjustable height provides durability and the ability to accommodate any size student (which fosters proper technique), and is an economic alternative to rosewood. Helpful Hint: Xylophone played with softer mallets can substitute for marimba. It is an excellent instrument for developing keyboard facility. There is a wealth of ragtime solo literature, which is both fun and educational for the young soloist. Xylophones should always be covered and protected when not in use. Be sure a protective drop cover comes with your xylophone. 1 1/2 octave 1 1/4″ diameter brass or chrome plated tubes (R500 or R505) Brass tubes have a bright, rich sound while chrome plated tubes have a darker, more mellow tone. Which to choose is simply a matter of weighing preference against budget as chrome plated chimes are more costly. The 1 1/4″ diameter tubes are lighter weight for easy transport and are more economical than 11/2″ diameter tubes. Helpful Hint: Chimes should always be covered and protected when not in use. Be sure a protective drop cover comes with your chimes. Rawhide mallets are an ideal choice for chimes. Acrylic mallets are an acceptable alternative, but tend to break more easily. 4 octave synthetic bars (R415) As with the xylophone, a height adjustable synthetic bar marimba is ideally suited for middle school use. Having this instrument will enable directors to expand their programs with percussion ensembles and allow middle school students to be exposed to the marimba as a solo instrument. This type of marimba is appropriate for middle school since most of the beginning and intermediate literature is played within a 4 octave range. Helpful Hint: Marimbas should always be covered and protected when not in use. Be sure a protective drop cover is supplied with you marimba. A 3 octave marimba (R410) is a more economical option. 3 octave silver bars (R705) The ideal vibraphone for middle school use should have certain features including height adjustability to foster proper technique, a uniformly wide bar design to develop the tactile sense necessary for playing keyboard percussion instruments, and a durable design that will withstand the rigors of young percussionist. Helpful Hint: With some transcription, vibraphone can substitute for many harp and piano parts. Single-locking casters stop the wheels from spinning, but do not prevent them from rotating. This allows the instrument to move as you pedal. Heavy-duty double-locking casters, which eliminate swivel and rotation, allow trouble-free pedaling. Vibes should always be covered and protected when not in use. Steel bars provide the maximum resonance and tonal clarity needed at the high school level. Helpful Hint: Ideally, the high school program should have two sets of bells: a steel set for concert use and an aluminum set (R135), which provides good sound projection while avoiding the possibility of rusting, for marching band. Often, percussion ensemble literature will call for two bell parts. Bells played with softer mallets can substitute for chimes, vibraphone, or celeste. Orchestra bells can also substitute for crotales. A height adjustable synthetic bar xylophone is very practical for the high school concert band program. Unaffected by weather, this instrument is also suited for the marching band pit. Helpful Hint: Xylophone played with softer mallets can substitute for marimba. It is an excellent instrument for developing keyboard facility. There is a wealth of ragtime solo literature which is both fun and educational for the developing soloist. The ideal scenario is to own a synthetic bar instrument and a second rosewood bar xylophone (R320W) dedicated exclusively to indoor concert use. Xylophones should always be covered and protected when not in use. Be sure a protective drop cover comes with your xylophone. 1 1/2 octave 1 1/2″ diameter brass or chrome plated tubes (R600 or R605) Brass tubes have a bright, rich sound while chrome plated tubes have a darker more mellow tone. Which to choose is simply a matter of weighing preference verses budget. The 11/2” diameter tubes provide optimum projection and resonance. Helpful Hint: Chimes should always be covered and protected when not in use. Be sure a protective drop cover is furnished with your chimes. A rawhide mallet is the ideal choice for chimes. Acrylic mallets are an acceptable alternative, but tend to break more easily. Some literature at the high school level may require the use of two mallets. 4 1/3 octave synthetic bars (R420) As with the xylophone, a height adjustable instrument will provide the most benefit for the high school band director. The durability of synthetic bar material and the benefit of being unaffected by weather make it ideal for outdoor marching band pit use. The 41/3 octave range allows for the opportunity to expand programs by exploring more percussion ensemble literature, and solo literature for those advancing students attending solo/ensemble competitions, all-state auditions, and college scholarship auditions. Helpful Hint: Marimbas should always be covered and protected when not in use. Be sure a protective drop cover is included with your marimba. A 4 octave instrument (R415) is an economical alternative and would suffice in the case of most literature. Parts not accommodated by a 4 octave instrument can easily be arranged to work. 3 octave silver or gold bars (R715S, R715SF, or R715G) Unlike chimes, there is no difference in sound between gold or silver bar instruments. The only difference is aesthetic. Helpful Hint: With some transcription, vibraphone can substitute for many harp and piano parts. Single-locking casters stop the wheels from spinning, but do not prevent them from rotating. This allows the instrument to move as you pedal. Heavy-duty double-locking casters, which eliminate swivel and rotation, allow trouble-free pedaling. Vibes should always be covered and protected when not in use. Be sure a protective drop cover comes with your vibraphone. 4 1/3 octave rosewood bar (R420W or R420WF) Much the same way that band directors have found the worth of having “marching horns” (sousaphones and trumpet-style baritones, French horns, and mellophones) and “concert horns” (traditional French horns and front action tubas and baritones), you will find the worth in having “pit percussion” mallet instruments (synthetic xylophones and marimbas) and “concert percussion” mallet instruments (rosewood xylophones and marimbas). Having two instruments, each dedicated to a specific use, will extend the life of both instruments while meeting the specific needs of each idiom. Helpful Hint: Above and beyond the benefit mentioned above is the fact that two instruments will allow you to expand your percussion program by performing literature requiring more than one instrument. Orchestra bells are the first priority because there are more parts written for bells than for any other instrument at all levels of music. It also substitutes for the other metal bar instruments nicely. Purchasing a second set for marching band extends the life of the “concert set”. Xylophone is second because it is the most frequently used wooden bar instrument and can substitute for marimba. Chimes are third; even though most parts can be covered on orchestra bells, the sound of chimes is quite unique and there are numerous parts written for them, often in conjunction with orchestra bells. The next purchase is a judgment call. If the school has a strong “classical” or “concert” program, a marimba would be the logical choice. If the school has a strong jazz program, it would be better to purchase a vibraphone. This instrument does have “legitimate” literature written for it also. In the public school situation, a synthetic bar marimba is preferable since its durability allows it to be used both as a concert and marching instrument. Ideally, a second rosewood marimba would be purchased as the primary concert instrument. Then, the synthetic bar marimba functions as the dedicated marching instrument and also as a second instrument in percussion ensemble. This purchasing plan is only a guide. It may be advantageous to go out of order if a year of budget surplus allows for the acquisition of a more expensive instrument (e.g. chimes before a xylophone). However, it may be wiser to get the next instrument on the list and use the additional money to purchase other needed, less expensive accessories. Let your percussive conscience be your guide.